The HW-16.5 is VPI's most-affordable record cleaning machine, but neither its build quality nor its cleaning power has been compromised. Its high-torque, 18-RPM turntable motor is more than capable of withstanding the pressure of heavy scrubbing during extended cleaning sessions, and its 35-second cleaning cycle per side makes quick work of even the dirtiest records. The HW-16.5's high-powered vacuum ensures quick, deep cleaning, while its newly designed vacuum pickup tube automatically adjusts to accommodate records of any thickness. The internal fluid collection system is made of stainless steel to prevent corrosion, and the fully-enclosed design prevents splashing or mess. In the VPI tradition, all components are extra heavy-duty, professional grade for a long, trouble-free life. Clean your records with the HW-16.5 and hear what you've been missing. Customer Reviews (4.93 Stars) 15 person(s) rated this product. I've owned mine for 17 years and cleaned hundreds of records with it. Garage sale specials and new vinyl all take a spin on the cleaner before I play them. It works, makes a big difference in sound even on new records, and it's lasted me 17 years and counting. I consider this a real component no different than an amp or cartridge. It is loud and takes up some space but that's a small price to pay. My only gripe is that you have to clean one side of one record at a time. The new cleaners than can clean a dozen discs at a time look intriguing but I'll stick with my HW 16 until it burns out. Which may never happen. I've owned a VPI 16.5 for over 17 years! I've owned the VPI 16.5 for 17 years and It still runs like new! However, I've also found that choosing the right aftermarket cleaning solution Is vital for the 16.5's performance as well as hearing the sonic rewards of a clean record during playback. 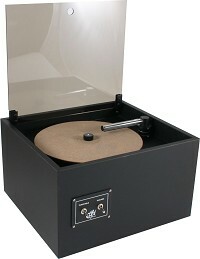 I know it seems like a lot of money, but this little record cleaner is worth every penny. You'll have to revisit your whole collection just to remember how good everything sounds. Before I actually went out and bought a RCM I never realized how much cleaner my records could be. Not to mention how much better they could sound. All I can say is "What was I waiting for?" I've spent more on this machine than I have on my turntable. Eventually that will change but for now it's ok. Because this machine has made my modest analog front end sound a lot closer to hi end than it did before. All in all I totally recommend this VPI. I've had and used mine for about 20 years now and it is going strong. What more is there to say ? I have a fairly large collection of old and new vinyl and bar none, every record has befitted from using this machine. I had been cleaning by hand and while that did yield noticeable benefits in the sound it cannot compare to the level of cleaning that this machine, which is the bottom end of the line from VPI, delivers in a consistent and efficient manner. I would wholeheartedly recommend this machine and agree with the other user reviews posted on this page. Great! I was skeptical of this products ability to revive older albums until I received it and began cleaning my first albums. I was astounded with the ability of this cleaner to turn older, well worn records into prestine sounding albums, eliminating pop's and the majority of surface noise. A must for any vinyl collector. I think it is worth the money. Part of me feels kind of stupid paying this much for a machine to clean records. However, it gets my records very clean. In the end I feel good about my coice. You need to be aware that you will be spending a good amount of money on cleaners and replacement tubes for the machine. But your records will be much, much cleaner. I bought my VPI 16.5 from Acoustic Sounds on the recommendation of a number of website reviews and a deep desire to bring my old vinyl back to life. The reviews were staggeringly positive and so I thought this machine would be great and make my records sound close to new. Well, I have been using it for about 9 months now and all I can say is that the reviews contained no lies or exaggerations! My vinyl did not sound almost new, it sounded better that new! In 1974 I bought Frank Zappa Apostrophe. I still have the album from when I was 14 and once it was cleaned (just a few days ago after sitting in my collection for 20+ years) it sounded PERFECTLY clean. No Kelloggs Effects (snap crackle or pops). This is the ONLY product that I EVER bought that completely lived up to its recommendations. It actually exceeded my expectations! There is a slight learning curve while you develop the cleaning technique that will work best for you. NO VINYL LOVER SHOULD DO WITHOUT! Screw the record into place, distribute the fluid and move the vacuum into place ... two or three turns later and the record is bone dry. And it's true ... my records, some of which I've had for thirty years, have new a new life. Some "pops" are still present, but the quality of the sound undermines any annoyance that these might add. I am very glad that I purchased this unit. EASY TO USE, EASY TO TAKE CARE OF ! Just got my machine. Works great. Vacuums records flawlessly. Completely dry in two turns. Turntable motor is quite quiet - vacuum is not, unfortunately. Might try installing sound deadening material on the inside of the case. Switches are high quality. All together very well made. If you've got a substantial investment in analogue, this is a wonderful addition. Records are visibly much cleaner than was possible with the manual brushes I've used over the years. Surface noise is greatly reduced. Very easy to use. Be sure to get some extra cleaning fluid, 'cause you'll use the heck out of this gadget! I've used my VPI 16.5 for more than 7 years now and still consider it to be the single most important component in my analog front end. Unless you have personally heard the difference a good "wet wash" can make, it is difficult to describe. Suffice to say that much of what most people believe are record scratches and wear, i.e., the pops, clicks and other noise nasties that plague vinyl playback, are not that at all. It is the dreaded "groove grunge," dirt, oil, vinyl slivers and other contaminents buried deep into the grooves of your treasured LPs. Only a good vacuum cleaner, such as the VPIs, can safely remove this grunge, and surface static electricity, too, and make your LPs sound new again. I cannot recommend this component too highly.